BTS received gifts from Alex and Maia Shibutani, American ice dancers and 2018 PyeongChang Winter Olympics bronze medalists. On March 10, Jin posted a selfie on the official BTS Twitter account with the words 'Thank you." 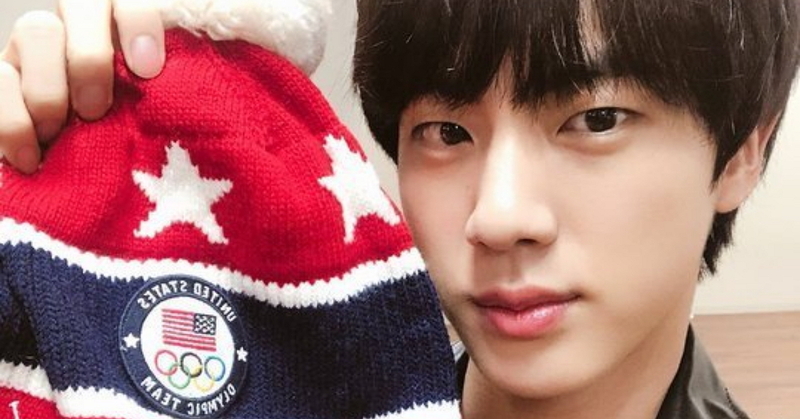 The photo shows Jin smiling, holding in his hands a personalized beanie gifted to him by the Shibutani siblings. 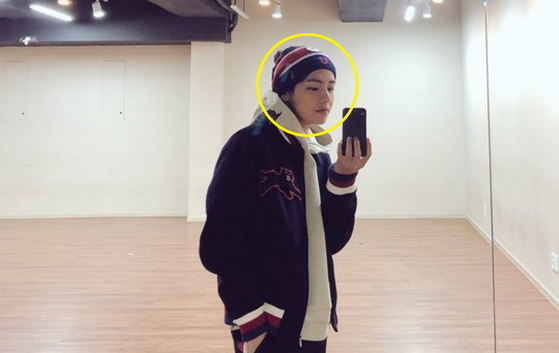 V also expressed his gratitude, posting a selfie of himself wearing the hat and writing "Color match. Thank you so much for the hat!" The Shibutani siblings wrote back. On March 11, Maia Shibutani wrote on her social media account "I'm so glad you got the hats!" and Alex Shibutani wrote "You're welcome. Much respect!" The Shibutani siblings visited South Korea to participate in the 2018 PyeongChang Winter Olympics' figures skating ice dancing competition. They felt closer to BTS just because they set foot in South Korean territory. A true ARMY, right? On February 17, the siblings took to Twitter, posting a photo of BTS-personalized knit hats (courtesy to Ralph Lauren) and wrote "(We) have these awesome hats for the guys (BTS) and we want to make sure they receive them. How do we make this happen?" Later, Big Hit Entertainment officials said to have helped the duo to deliver the hats to BTS members. 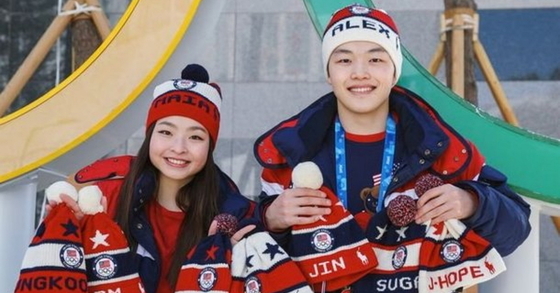 The Shibutani siblings are the proud bronze medalists of the 2018 PyeongChang Winter Olympics' figure skating ice dancing held at the Gangneung Ice Arena on February 20, scoring a total of 192.59 points. 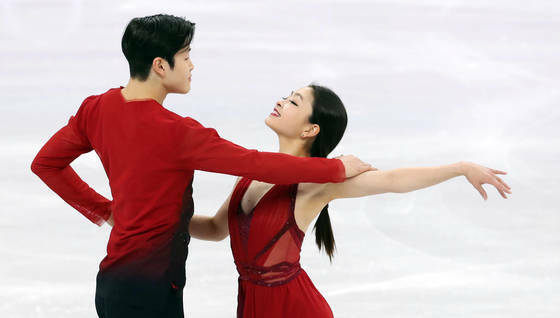 US' Alex and Maia Shibutani at team event ice dance free dance skating competition at 2018 PyeongChang Winter Olympics. February 12 at Gangneung Ice Arena. Photo from YONHAP. Later, in an interview with PEOPLE, Alex Shibutani stated that he would like to "give them (the hats) to BTS," and expressed his admiration for BTS, stating "We really appreciate and respect their work that they do," and adding "What they've done breaking through to Western pop culture is awesome." He went on, stating "We've been, in our careers as ice dancers, sort of trailblazers in a way, just given our look - not just being siblings but being Asian-American. We're the first ice dance team of Asian descent to win a medal in the Olympics, and so that was something that we're really proud of." Apparently, the ShibSibs admire BTS reflecting on their own obstacles of being of Asian descent to ice dance in America. The U.S. and Europe are the traditional strong players in figure skating. The Japanese-American Shibutani siblings were born and raised in America, born under Japanese parents.